Download A Day in the Life of a Kindergartner brochure here! The day starts out with our morning routine. The children are responsible for placing their things in their lockers, putting their take-home folders in the designated spot, and ordering lunch. After the morning routine, the class comes together as a whole group. We recite our morning prayer and the Pledge of Allegiance. Students then participate in circle time. During circle time, we discuss and record the date on our calendar. Student volunteers make observations and chart the weather. Circle time is also used for the teacher and class to share important news. During the morning, the class actively explores various subject areas, with a focus on language arts and mathematics. Instructional techniques vary. Some things are taught in a whole group setting, and others are taught in small groups. Each kindergarten has a teacher and an aide, allowing each child the opportunity to receive individual attention. Our language arts program incorporates the Houghton Mifflin Harcourt Journeys reading series. 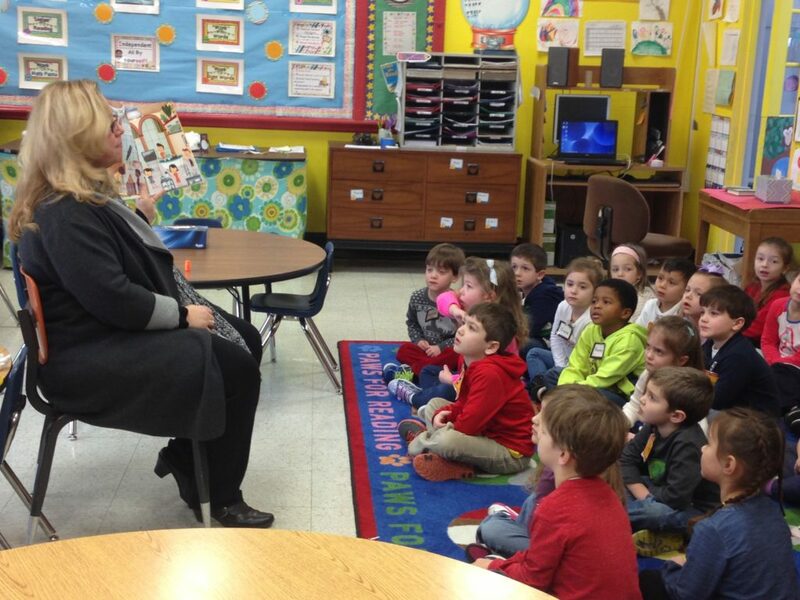 The class follows along as the teacher reads “big books”. The children also read little books in small groups. A strong emphasis is phonemic awareness. Children not only learn to recognize the letters of the alphabet and their corresponding sounds, but how to put sounds together in order to write stories, using our word walls and inventive spelling. We practice reading our sight words regularly. Kindergarten math includes basic counting and number recognition, positional words, use of a calendar, counting by 2’s, 5’s and 10’s, adding, subtracting, beginning fractions, time telling and geometry. We spend a great deal of time using manipulatives and math games to allow children to develop a firm understanding of the various math concepts. These activities encourage children to use creative problem solving. Seatwork and hands-on activities are spaced throughout the day in an age-appropriate manner. The kindergartners enjoy a small, nutritious snack sent in by their parents. Each day, the children participate in a “Special”. These classes include Art, Physical Education, Music, Library, and Computer classes. Our kindergartners enjoy painting, drawing and creating spectacular artwork with the assistance of our Art teacher. Physical education is always exciting. The children participate in a variety of sports, games, and team building activities under the guidance of our Athletic Director and Physical education teacher. Our music teacher leads the class in music. You may find them making rhythm instruments or playing a rousing game of “Name That Tune”. They love to sing! During library, the children listen to stories and learn about books, authors and illustrators. they are also able to check out a book of their choice. Our librarian makes book characters come alive for our young readers! Computer class is always a favorite with our kindergartners. Every class is an adventure! Children are engaged in a multitude of learning activities which include virtual field trips, creating drawings, and practicing their math and reading skills. Lunch is served in our cafeteria. Students have the option of bringing in their lunch from home or purchasing a hot lunch. Milk and snacks are available. Recess is also a part of the day. You will frequently find us outside on our new playground. The children are encouraged to play freely with their classmates. This is a wonderful opportunity for the children to develop friendships and social skills. Our afternoons are filled with science, social studies, and religion. Some of the topics the class learns about include plants, animals, the solar system, communities, careers, daily prayers, Bible stories, and religious holidays. 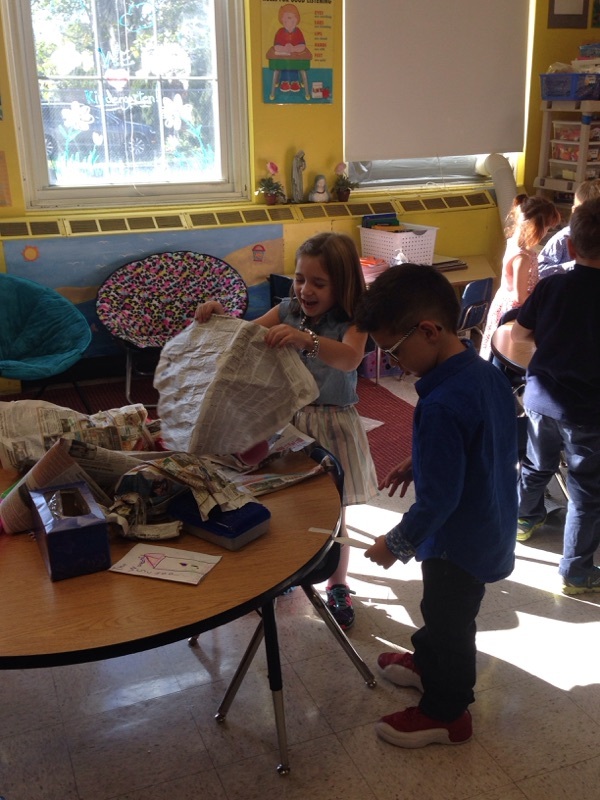 The kindergarten experience is filled with special activities throughout the year. The class prepares a Paraliturgy; a play performed for the entire school that teaches a religious lesson. Each month a “Student of the Month” is chosen. This student is rewarded for his or her outstanding effort with a special breakfast with the Principal and other “Students of the Month”. Field trips are also scheduled to enhance learning. Kindergartners participate in our Christmas program. They never fail to steal the show! Additionally, they perform a service project for the community. In the past, we have visited a nursing home and collected food for an animal shelter. Our third grade students enjoy spending time with their kindergarten reading buddies. The third graders read stories and play learning games with their kindergarten friends. The class regularly attends Mass. Fr. Jerry leads our school in prayer each Wednesday morning. Many parents join us for this lovely service. We have a children’s choir complete with violins, bells and flutes. Other school sponsored events include a Halloween Party, a spectacular Father-Daughter Dance, and a Mother-Son Bisons day. The year ends with an unforgettable graduation ceremony and reception. Our day ends with a prayer. We pack up our things and get ready to go home. Many children attend our After School Program. Child care is available until 6:00 pm.